Where do you stand on hyphens in general!? I tend to remove them from academic documents because (in my opinion) the prose should convey its meaning through correct syntax and punctuation, such as commas, semi-colons and colons, rather than relying on hyphens. I don’t think it matters so much in non-academic prose but it’s one of my bugbears, along with using “as” instead of “because”, in academic writing! Ah, there’s a whole other post on that to be done, isn’t there. I assume you mean the ones between words? I follow Oxford – just before the subject or object, not after – part-time work but working part time, and never with a -ly word beautifully full inboxes. And I am pretty sparing with them unless the sense demands it. I mean as you have used here, as a form of punctuation: “I assume you mean the ones between words? I follow Oxford – just before the subject or object, not after – [etc]”. I actually prefer parentheses to hyphens in examples like that or commas. I used hyphens when two words form an adjective, like you do. But I have a feeling that I may be old fashioned about the other type of hyphen. US long, UK short, so the US ones fill the space between the words and the UK ones have a space each side. 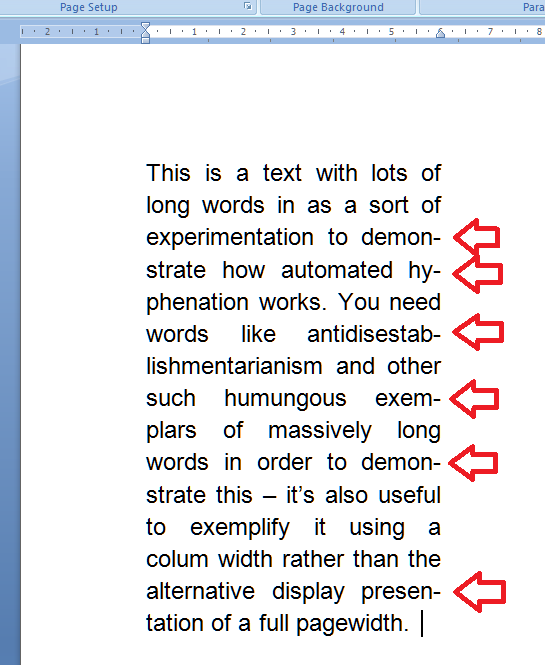 I have noticed a new nasty feature in Word 2013. It prevents hyphenating across pages. Although the idea is OK, its realization is annoying. 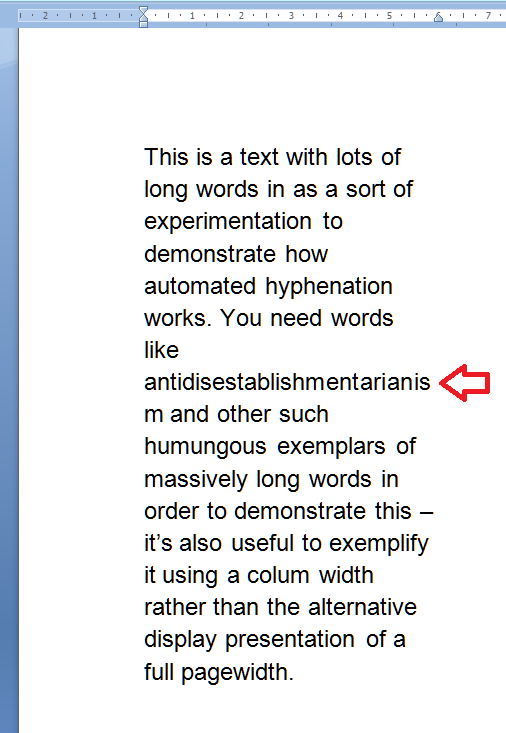 In details: if the last line of a page ends with hyphenated word, it is moved to the next page (instead just switching-off the hyphention for that word). The effect is that pages has sometimes big gap at the end (missing 2-5 lines). Does anybody know how to switch-off this feature? Did you already find a solution for this problem? I’m not sure whether the solution I offered worked or not – are you having the same problem, and have you tried my suggestion? is there a shortcut or alt code or macro that will hyphenate a selected series of words? For example, something that would change point of contact to point-of-contact? Thanks!! 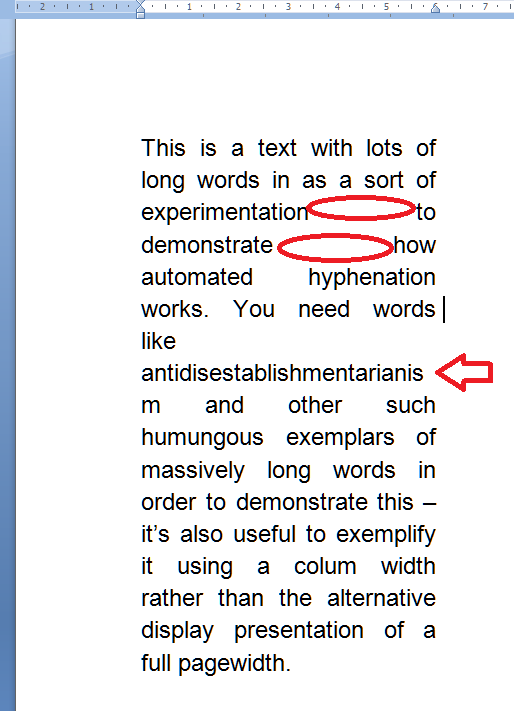 Most automatic hyphens entered by WORD are fine but is there no shortcut to eliminate one of those, e.g.. when they result in half a word on a single line? Thanks for your comment, Martin. You can highlight the word, turn the hyphenation to manual and then hyphenate or not as you wish. Does that help? 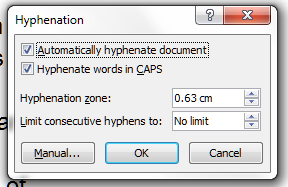 Is there any way to set automatic hyphenation as a standard feature, so to speak, so that any new Word document that we open will have it already installed? Yes, if you set up the document how you want it and then Save As Template, you will have a new template you can use when you want to use these features as a default. Back to where I started…”configuring” is split again. GRRR. Second verse same as the first. This is a rather awful loop to be stuck in, especially on deadline. Oh dear – that does not sound like fun. I fear you may have to do what I do when formatting goes on its own way and you’re being driven mad by it … If it’s possible, try copying and pasting the text into a brand new document. Even better is to pop it into a text editor (like Notepad) first or remove all formatting, but if you’ve got complicated formatting, that can make things even more time-consuming. I know it sounds like an over-simple solution, but it works for me! Let me know how you get on. Thank you very much for nice explanation.. Thanks a lot! This was extremely helpful. Sorry for the necropost, but this blog post is the top Google result for word hyphenation. 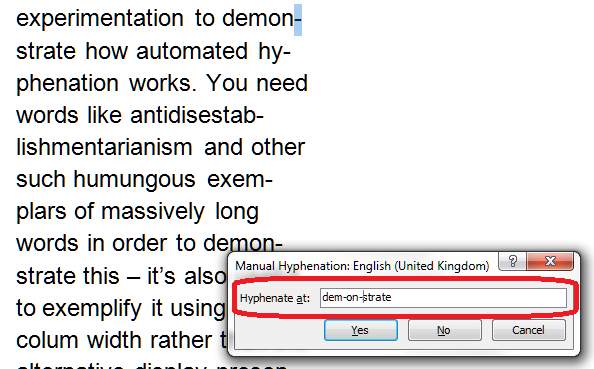 First, regarding manual hyphenation: You can press Ctrl+- (Ctrl and minus/hyphen) to insert a “soft hyphen”, which is only shown if the word is hyphenated there, otherwise it is invisible. 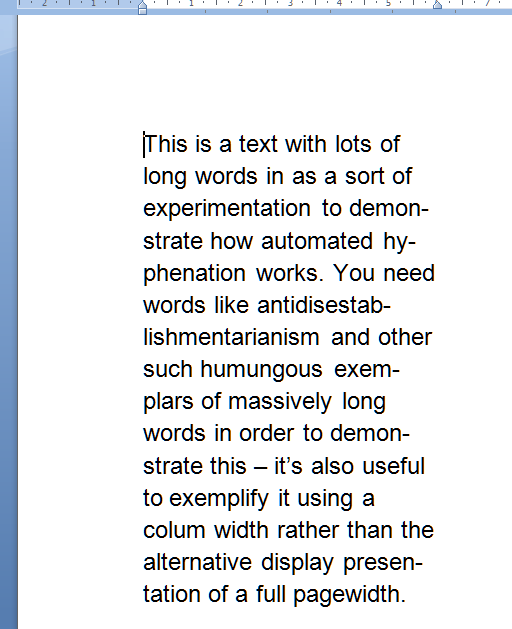 Very handy even with automatic hyphenation turned on if you have long words (usually scientific) that Word does not have in its hyphenation dictionary. Secondly, and the reason I came here: What ways are there to deactivate automatic hyphenation in just a given part of a Word document? In the paragraph dialog, under the text flow tab you have a “Do noy hyphen” checkbox so you can turn this of for a certain paragraph. However, I want to disable hyphenation in a table, and within table cells the paragraph dialog does not seem to be available. I’m always happy to see comments on older posts (I still get lots on my very first how-to post, which I really wrote for myself, many years ago now but still causing issues!). Thank you for the note on soft hyphenation, that’s new to me and appreciated. As to the table hyphenation – try this. Highlight the cells you want to affect. 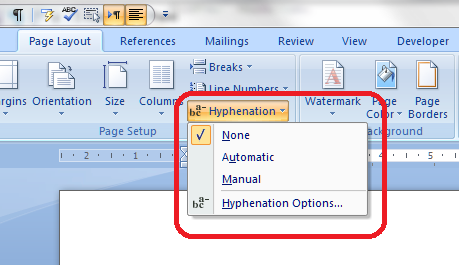 Instead of doing right-click and Paragraph, go to Page Layout – Hyphenation (bottom right) and then you get the hyphenation options. Give that a go and let me know how you get on.